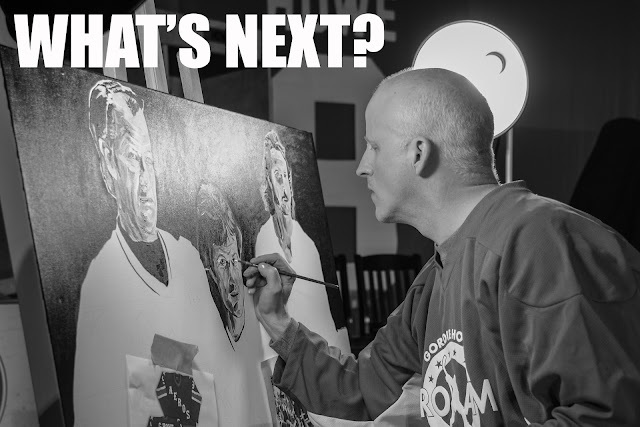 As the final brush strokes and signature are being applied to the canvas, part of my brain begins to shift to the important question of "What's next?" Over the months of painting full-time, I've developed a pattern that finds me bouncing between complex commissions, people, animals and still life paintings. After a particularly challenging or large custom order, I like to reward myself with something spontaneous and fun. If I don't know the answer to the question of "What's next? "- which does happen from time to time - I slip into bed and have a quick nap. The answer always comes to me when I fall asleep with the intention of figuring it out. It's been a busy six months with a full calendar of paintings, live painting events, workshops, and school visits. I actually keep an old school monthly calendar as my way of keeping myself organized. I also use Google Calendar, but my hard copy calendar is my rock. Without it, I feel lost. The summer is an odd time of fewer painting event commitments and more family time. We're going to be heading back to Saskatchewan, doing some travelling in Alberta, and getting Dylan ready to head off to school in Montreal in the fall. I also have a big set of paintings to do for something coming up in Ottawa this fall. As always, I'll be continuing to work on long-standing requests and working ahead on projects that have been promised to be completed in the fall. If you have an idea of what should be next, either a subject or an event, don't hesitate to get in touch. Much of this artistic journey has been inspired by people like you who have an idea and choose to share it with me. You can connect with me through my Russell Thomas Art Facebook page, Twitter, Instagram, or good old fashioned email (russell.thomas@birdsongconnections.com).